If you are anything like me, you may not know about the pig rescues all over the world. I was completely blind to the fact that there was a problem. Now that I do know, I feel like it's my responsibility to let others know about these people who have stepped up to help these unwanted, sometimes sick or hurt pigs that no one else would take in. Please take a moment to go through this list, see if any are close to you and go visit. Go volunteer, donate some time or money or supplies to help, if you're able. Sometimes just a thank you goes a long way so they know they are appreciated. These pig rescues don't get the attention or praise they deserve. Even sharing the fact that they exist could be helpful in some cases. We have included links to a charity that raises money not only for rescues, but also pig parents who are having financial difficulty in providing appropriate care for their pig, usually in emergency situations. I have also included a link to pig placement network which is an organization that helps to place unwanted or homeless pigs in approved homes all over the country. Please click on their website link to learn more information. ​If you are a rescue listed here and wish to be removed from the list, please email us at minipiginfo@gmail.com. Please send this to any animal shelter or animal control you can think of. Microsanctuary Movement is an organization that promotes smaller new start up rescue/sanctuaries and can aid and assist with getting someone started in the sanctuary realm. Let me repeat the information above. These rescues are NOT listed for you to contact in order to surrender your pig. I would go as far to say that the majority are FULL and likely overfull. Click here to see their story featured on their local news! Hooves, Hope and Love Inc.
2 The Rescue Animal Sanctuary Inc.
SASHA does not adopt pigs out. Every pig there will live their lives out at the sanctuary. Billy's New Hope Barn, Inc. Mainly rescues horses, but does have a few pigs available. This is an animal rescue link for the USA. Not pig specific. I do not have a pig rescue but obviously have friends that do. I have the ability to travel and go physically help some of my friends, but others do not have that luxury. 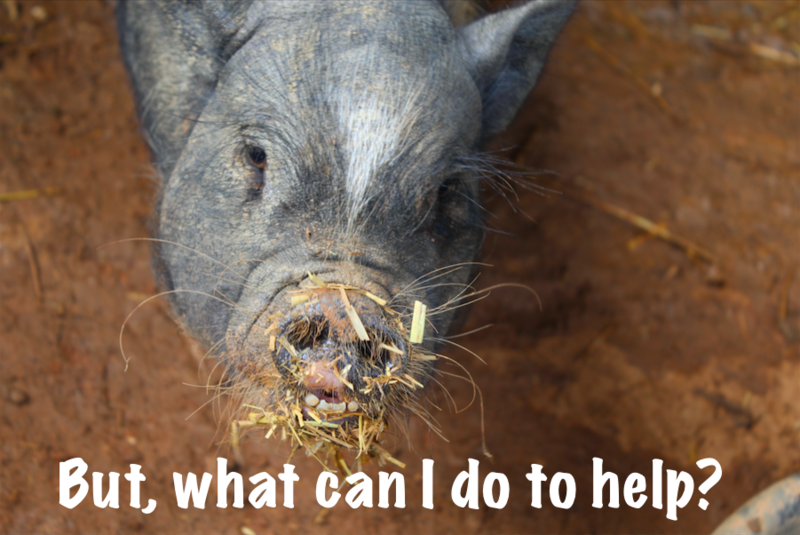 You can help pig sanctuaries and rescues in many many ways. Donations are ALWAYS welcome. Donations do not always have to be money, you can donate time to physically help, donate your networking skills, donate time at the rescue giving belly rubs. You can host a blanket drive or hay drive or pumpkin drive for a local pig rescue. You can simply reach out and ask how you can help them. Most pig rescues average 25+ pigs. Can you imagine caring for 25+ pigs? How about 600+? That is what several of these heroes do every single day. Contact the sanctuary/rescue and ask what they need. Ask them if they have an amazon wish list, if not, ask them if they would be ok with you creating one for them, ask if they need sponsors for their animals, ask if they need someone to take pictures and write up stories for their animals to be added to their website or social media pages. There is so much that has to be done on a daily basis and if you throw in an unexpected emergency on top of what they already have to do, things that seem insignificant to most people get put on the back burner. These things can literally help a lot though. I know I have seen pictures and read stories that touched my heart so much that it has been the sole reason for me donating money to a rescue. So these stories that seem insignificant can have a HUGE impact to everyday people who don't get to read about these things everyday. Sometimes simply sharing their posts or links to their website or fundraisers is what may be needed, and that literally doesn't cost you a dime. Everyone watches how much they spend, they cannot donate money they don't have and that is understandable. But, that isn't the only way you can help. Help network adoptable pigs at these rescues, help them spread the message they're trying to get across to others. Perhaps you can help them transport a pig in need, or maybe write letters to big organizations asking for donations of supplies. These types of actions can really help the people who have gone above and beyond to take in the un-adoptable pigs, the pigs that no one else wanted, the pigs that required extensive medical care or expertise. 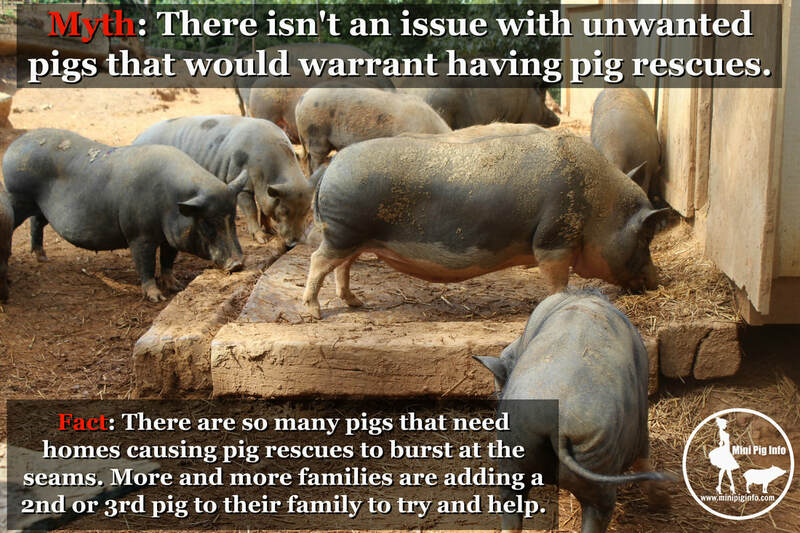 EVERYONE of the pig rescues/sanctuaries have "just one more'd" themselves to overfull. I can't think of one who steps up regularly to take in the hundreds of unwanted pigs that are looking for homes now. Why? Because they can't, they cannot physically take one more, they can't financially care for one more, they don't have room for even one more, they can't afford the spay or neuter for just one more. It is a vicious cycle and always has been. That is where you can help though. Find out if they have a volunteer program, if not, ask them if they would like you to coordinate one. Perhaps they would love to do one, but feel like they need a major clean-up effort before they could even think about one. Offer to help coordinate that or go help DO that. If your heart is in the right place, your generous gift of time will be very much appreciated. 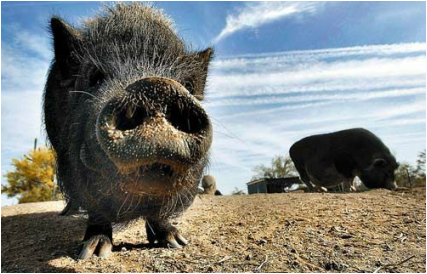 This is a rescued pig named Angel from Arizona and is now living at a sanctuary. PLEASE do you research! People can talk and say all the right things. It doesn't matter what questions you ask, dishonest people will be able to answer questions to your satisfaction because they already know what you want to hear. PLEASE ask questions before handing your pig over to someone else. Go to their property and check things out. Ask other people in the pig community what they think about them and research. Research names, addresses, phone numbers. If someone isn't willing to give you this information, you may want to consider taking your pig elsewhere. There are a lot of groups on FB that are known to help rehome pigs, but its never a guarantee that its an appropriate piggy approved home. 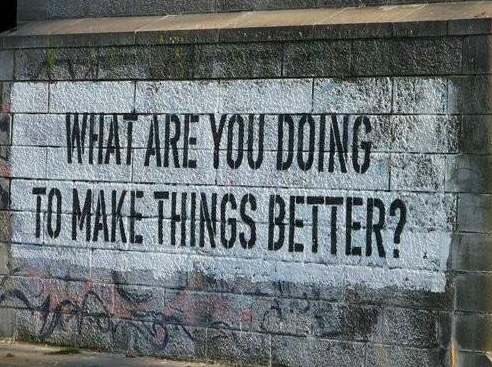 YOU are responsible for checking things out. If you wouldn't adopt your child to this person without checking them out, then don't send your pig to an unknown fate!!! People can be awful sometimes. And not doing your homework can lead to a less than desirable outcome and even worse, death of your beloved pet. Here is a list of things you can check for yourself to be sure the person who is getting your pig is knowledgeable or ready for a pig. We have added an adoptable pig page to our website where YOU can add information to a map and anyone who is looking to adopt a pig would be able to find your pig by viewing our map. Click here to go to that page. 1. Google that persons name to be sure its not showing up elsewhere in otter animal situations. Disclose everything to them. Dont hold back, you dont want your pig to be rehomed several times, you only want to do this once. Once you are able to witness a pig grieving, you'll understand why. There isn't much worse than a pig crying real tears because his/her human mom is leaving them in some strange place. 2. Find out if they'll keep you updated or ask if they will send you pictures of your pig or if you can visit. 3. Also ask what happens if it doesn't work out? Should they call you? Or a designated friend? Was there more than one person interested? 4. Ask them about their experiences with pigs, do they have one? Did they have one? What happened to it if they no longer do? Did the novelty wear off, did they grow too big? Did the pig have behavioral issues? Did they just get tired of the responsibility? Did they move to an area where pigs aren't allowed? Are they zoned now?? And if they've rehomed a pig, Why? 5. Is this person zoned to have a pig(s)? 6. Do they have a vet that sees pigs? Ask for pictures of where they plan to keep your pig, Ask for pictures of their property. 7. Do they have a fence to protect you pig? 8. Ask others if they've heard of that person, but dont make your decision based on someone else facts, look them up for yourself or ask the person directly. If they're unwilling to answer these questions, they are not the right person for your pig. If you feel uncomfortable, TRUST YOUR GUT INSTINCT!! You'll be glad you took these extra precautions!! Reach out to the people who know how to screen adoptive families to be sure they have appropriate accommodations for a pig. Most people don't know what questions to ask or have the ability to do a thorough home check to be sure what someone is telling you is accurate. PPN's link is posted above, contact them, let them know what your situation is and let them help. There is help out there, I am letting you how to find/access it. Pig Adoption Application (GREAT EXAMPLE FOR AN ADOPTION APPLICATION. SPECIAL THANK YOU TO LORELEI PULLIAM OF GALLASTAR THERAPEUTIC RIDING FOR THE USE OF HER CONTRACT FOR EDUCATIONAL PURPOSES.) As you can see, she is VERY specific about where her pigs will go, the accommodations, as well as the education of the potential owners. EDUCATION is the key to a successful placement! We are committed to finding safe, loving homes for our homeless potbellied pigs, but we are also cautious and want the new owner to make an informed decision. For the right people, they make wonderful companion animals but for others they can become a nightmare, so please be sure and do your homework first. To help us determine your qualifications and match the right pig to your home, please fill out this application as completely and honestly as possible. It will require some time and thought on your part, but it will help us match each precious pig with the perfect home, as well as give you better insight on what it takes to prepare the perfect home. If no, please have parent/guardian complete and sign the Application. Many communities do not, and they have the legal right to come to your home and confiscate your pet if it is against their zoning ordinances. If you live in a planned community, you will need written permission from your homeowner's association to have a pig. Even though local zoning ordinances may permit pigs, a homeowner's association has the legal right to refuse them. Are you willing to take an un-socialized pig (one who has had little to no human contact)? It is very important to find a vet who will treat the pig before actually getting one. A potbellied pig has different medical needs than your typical companion animal or even a farm pig. These vets are few and far between and could mean the difference between life and death in an emergency. I understand that the average weight of a full-grown potbellied pig is 75-150 pounds, some smaller and some larger, and that genetics determines size. Underfeeding the pig will not change his skeletal size and will only lead to health and/or behavioral problems. Over-feeding the pig or not feeding him food specific to his species will also lead to health and/or behavioral problems. _______ Yes_______ No________ Need more information. I understand that rooting is a basic natural instinct and that ALL pigs will root to varying degrees. This can lead to destructiveness in the house when they are bored and do not have other outlets or if they do not get enough outside time. It can also lead to destructiveness of lawn and flowerbeds. I understand that dogs and pigs must be carefully monitored and should NEVER be left unsupervised together, even the most gentle dog and even if the pig and dog are best of friends. They are both animals with animal instincts. Dogs are predators and pigs are prey, and a dog can kill a pig if provoked. I understand that a pig can become territorial. This can include growling, snapping, charging, or even biting to varying degrees. It is most common in house pigs but can also occur outside. In the wild, pigs are herd animals, and it is a natural instinct for them to try to test their dominance and become "top hog". Behavioral modification techniques can help. Because of this instinct, children and pigs must always be carefully supervised. I understand that a pig should not be placed in a home until he is at least 8-12 weeks of age, properly weaned, and eating on his own. Earlier placement can lead to starvation and/or aggressive behavior. I understand that spaying/neutering of all pigs is ESSENTIAL, not only for reproduction purposes but also for behavioral and health reasons as well. An unaltered pig does not make a good house pet. An unaltered pig may also develop reproductive organ disease when older and larger and no longer a safe surgical candidate. I understand that it will most likely be difficult to find a competent vet who will care for my pig. I also understand that I must have a plan set up in advance to get my pig to the vet in an emergency situation. This plan should include an adequate vehicle and adequate muscle if the pig is no longer mobile. In the case that this pig is to be a companion for a current pig, I understand there will be an "introduction" period between the two, whereby they work it out between themselves who will be "top hog". I understand that this animal is a pig, and as such, I will allow him to be a pig. I understand that he has specific needs basic to his nature, and I will strive to meet those needs and appreciate the very qualities that make him such a unique and delightful creature. Are you committed to care for the pig for his/her life. (it is estimated the lifespan of a potbellied pig can be up to 20 years)? (Signature to be obtained at home inspection) You will be notified as soon as possible after the screening process is completed. Thanks for taking the time and showing interest in adopting a homeless animal from one of our many sanctuaries and shelters. Contact info for rescue whose adoption application this is has been removed for privacy, but a special thanks to them for allowing us to use for educational purposes.